Now a drawing of warmer climates. 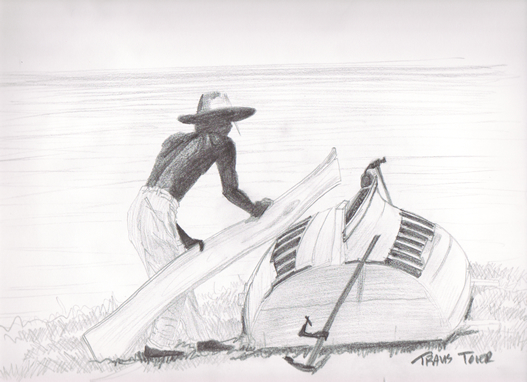 The art of boat building and boat repair. A fine craftsmen making repairs to his boat. This was another fun one to draw, and had several challenges. Hope you enjoy. This is another variation of an earlier piece named Early Retirement. I kept to using only violets. I think this brought out the fog more and gives you a chilly feeling. I like the way the trees and water turned out. Much cleaner and more crisp.